Last year’s Scottish Premiership calendar ended on a high note, with huge derbies in Glasgow and Edinburgh. Celtic travelled to Ibrox looking to extend their lead over Rangers at the top of the table to six points with a game in hand, while Hibs welcomed Hearts to Easter Road having recently picked up five points in three clashes with the Old Firm. But the script was flipped. Rangers won their first league derby in six years to move level with Celtic, applying real pressure to the reigning champions going into the winter break, while Hearts got their first away win over Hibs in almost half a decade to embed Neil Lennon’s men in the bottom six. The defining factor in both games was the way in which the victorious side defended against their opposition. Here I will analyze the successful pressing strategies employed by Rangers and Hearts. Rangers 1-0 Celtic: What happened before? In Rangers’ previous meeting with Celtic they struggled to gain any sort of control in the contest. While their defending was better than it has been in recent derbies, they were unable to offer any real attacking threat. Essentially, Brendan Rodgers’ side contained them with the ball. Alfredo Morelos was unable to apply effective pressure against a three-man back line and a double pivot. Whenever he moved closer to the centre-back in possession, the ball was comfortably moved either along the back line or into the feet of one of the two No.6s. Despite the success of his 3-4-2-1 system at Parkhead, Rodgers opted for a more familiar 4-3-3 for the trip to Ibrox. Meanwhile, Rangers changed from their usual shape, going with a 4-2-3-1. Ultimately, the changes worked in the home side’s favour. This season Rangers have generally defended zonally. However, here they copied Aberdeen to an extent by introducing some man-marking in certain areas of the pitch. The man-marking was most visible through their No.10, Scott Arfield, covering Celtic No.6 Scott Brown. Behind Arfield, Ryan Jack and Ross McCrorie were more flexible so as not to leave the space between Rangers’ midfield and defensive lines completely open, though both also consistently man-marked their opposite men, Olivier Ntcham and Ryan Christie. Both full-backs, James Tavernier and Andy Halliday, also tended to follow Celtic’s wingers infield, safe in the knowledge the two centre-backs, Conor Goldson and Joe Worrall, would be 2v1 against Mikey Johnston (or both marking space should Johnston drop back). Pass back to Craig Gordon. This wasn’t ideal for two reasons, one being Gordon’s shaky distribution from his feet, and the other being it allowed Rangers to step up and force Celtic into long balls, meaning they couldn’t perform their preferred build-up from the back. Play forwards. Preferable to simply passing back to Gordon and going long, but difficult due to Rangers’ pressing. Celtic’s centre-backs could pass to their central midfielders, though this came with risk due to the man-marking of Rangers’ central midfielders. Brown, Ntcham and Christie rarely had time or space on the ball to control, turn and progress the attack. The alternative to going through the middle was to go wide to the full-backs or wingers, though Rangers’ own wingers made this option equally fruitless. Gerrard’s decision to opt for a mixed defensive scheme, combining some man with some zonal marking, paid dividends here. Aberdeen’s man-marking extends to the wide channels, so their wingers man-mark Celtic’s full-backs, positioning themselves directly between their opposite man and their own goal virtually at all times. But Rangers decided against this. Instead of having Daniel Candeias and Ryan Kent (circled above) mark Celtic’s full-backs man-to-man, Rangers’ wingers were positioned in the inside channels. This opened up a number of defensive possibilities. Kent and Candeias’ positioning meant that, even if they were unable to intercept passes from Celtic centre-back to Celtic full-back, they could still apply immediate pressure to the full-back. 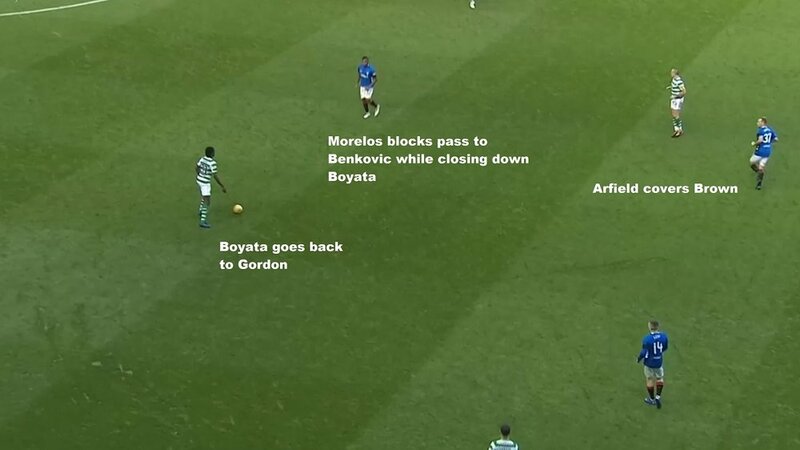 So when Lustig or McGregor received possession, they found themselves instantly closed down near the touchline, an area of the pitch where there are limited options. On top of that, the pressure was from inside to out, reducing the scope for a simple pass inside or a return pass to the centre-back. Due to their marking a zone and not their opposite men, Kent and Candeias both had better access to Celtic’s centre-backs, meaning they could step up and pressure Boyata and Benkovic if and when the opportunity arose. 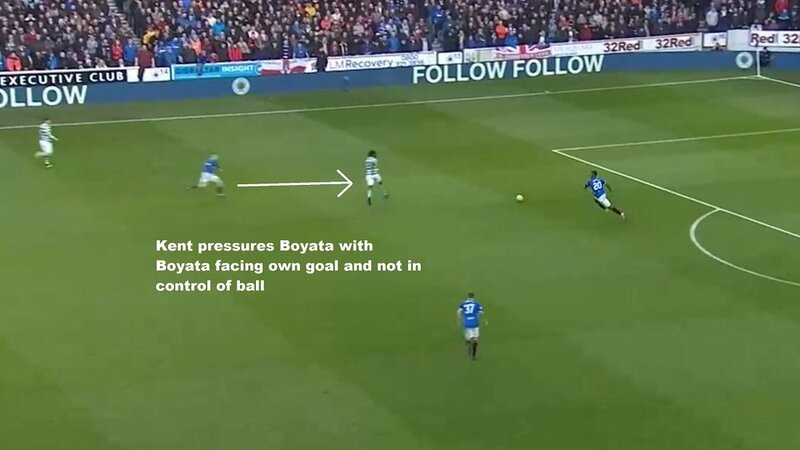 Kent was particularly astute in this respect, stepping up on certain triggers (Boyata facing his own goal, or not having control of the ball) to dispossess or at least hassle Boyata into a turnover. How could Celtic have done better? Celtic struggled to build out against Rangers, with forward passes generally going wide or into the feet of players who were closely man-marked. Furthermore, when they were forced into backwards passes, Rangers moved up as a unit and continued to apply pressure higher up the pitch, forcing Celtic into long balls. As a consequence of all this, Celtic ended up with just 47 per cent possession, much of which was ineffectual. Luring Rangers’ wingers wide with quick one-twos between centre-back and full-back, opening the inside channel for a forward pass into the winger’s feet. Overloading midfield through Johnston dropping deep to create a 3v2 with Ntcham and Christie up against McCrorie and Jack, leading to a free man. Adding another No.6 and playing with a double pivot to ensure another passing option and more control of possession. This would also force Rangers to reconsider their defensive approach, as man-marking a double pivot would have left more space between their own midfield and back four. Normally when teams line up in a 3-4-2-1 system, as Craig Levein’s men did for this particular match, they have their wing-backs and inside forwards drop back to form a 5-4-1 shape in the defensive phase. However, Hearts stayed in a 3-4-2-1 shape here, with their inside forwards, Olly Lee and Sean Clare, and their wing-backs, Marcus Godinho and Ben Garuccio, heavily involved in intense pressing. Hibs were keener to play out from the back here than they were at Tynecastle in October, though their three centre-backs – Efe Ambrose, Darren McGregor and Paul Hanlon – were given very few options by the defensive actions of their opposition. The most obvious pressing triggers for Hearts’ front three were sideways or backwards passes along Hibs’ back three. If Hibs’ outside centre-backs passed inside to McGregor, Steven Naismith – leading Hearts’ front line – would push up to close him down. This rushed McGregor, giving him little time to control the ball, look up and spot a teammate to pass to. If Hibs passed along their back line to one of the outside centre-backs, Clare and Lee would close down their opposite men. Again, this took time away from the ball receiver, forcing them to rush their decision regarding the next pass. But more important than the simple act of applying pressure was the way in which Hearts’ inside forwards applied this pressure. Considering Stevie Mallan’s quality on the ball, the idea of Hearts sacrificing pressure on him to close down Hibs’ central defenders might seem a tad self-destructive. However, Mallan was often taken out of his team’s build-up by Lee and Clare’s pressing movements. As discussed, Lee and Clare stepped up to pressure Hanlon and Ambrose respectively when one of the Hibs pair received a sideways pass. When stepping up, the Hearts duo would make sure to angle their run so as to form a cover shadow on Hibs’ central midfielders. Below, Lee forces Hanlon long by taking away his pass inside. By taking one quick step to the right (Clare) or left (Lee) before closing down their opposite men, they reduced Ambrose and Hanlon’s time on the ball while simultaneously blocking passes into Mallan or Vykintas Slivka. Hearts’ inside forwards effectively defended two players at once. With passes into central midfield no longer a viable option, Hibs’ centre-backs often had to go wide to their wing-backs. But their wing-backs were quickly closed down by their Hearts counterparts, Godinho and Garuccio, making further progression from there difficult. Often the safest pass was to goalkeeper Adam Bogdan, who would then go long as Naismith and co. stepped up. While Naismith, Lee and Clare were integral to Hearts’ pressing, they needed support from Peter Haring and Arnaud Djoum. Had one of the central midfielders not stepped up to stay reasonably close to Mallan and Slivka, Hibs’ centre-backs could easily have bypassed the pressure by playing loose passes into the general midfield area for their teammates to pick up. However, if Djoum and Haring both pushed up, space appeared for Daryl Horgan, the No.10 in Hibs’ 3-4-1-2 formation, to exploit between the lines. The Irishman became his team’s free man, moving laterally to offer his centre-backs a forward pass in the inside channel to break multiple lines of Hearts defence. One of their central midfielders (Haring or Djoum) would recognize the threat of Horgan when Hibs’ build-up went out to Ambrose or Hanlon, dropping off to cover Horgan while the other central midfielder remained higher to stay close to Mallan and Slivka. The far-side inside forward (the one not applying pressure in a given moment) would tuck inside to a more central position, helping to cover Mallan and Slivka and ensuring Hearts weren’t overloaded 1v2 centrally. As the game wore on, Hearts became more conservative. They pressed Hibs’ centre-backs less often, with Lee and Clare holding their position more and simply blocking passes into central midfield. This allowed Hibs to establish more control of possession as Ambrose and Hanlon had far more time on the ball than they had enjoyed earlier on, though this was not capitalized on. 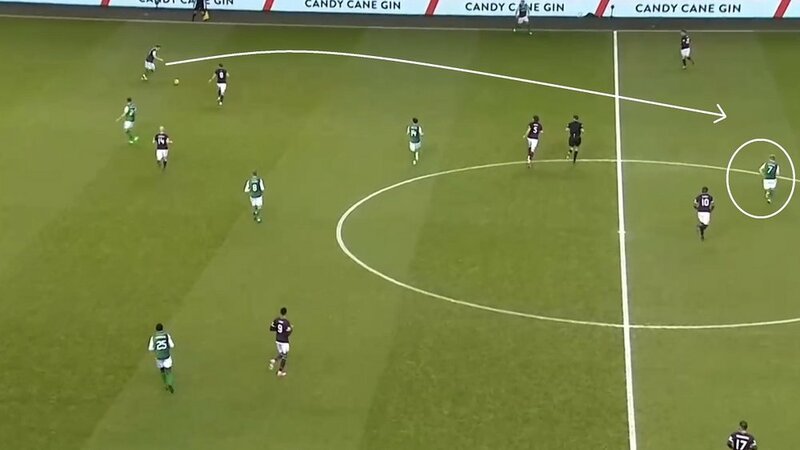 Hibs’ possession strategy, perhaps because they were 1-0 down, became increasingly centred on long balls into the central zone that Hearts dealt with easily not only due to the numerical advantage of their three centre-backs against two Hibs strikers, but because their centre-backs, particularly Christophe Berra and Clevid Dikamona, are strong in the air. How could Hibs have done better? Just after the 17-minute mark, Oli Shaw (Hibs’ left-sided striker) peeled off the frontline to receive possession from Hanlon in the left inside channel. This movement is something Hibs could, and should, have used more often. It could have caused Hearts numerous problems, as outlined below. As seen in the graphic, Shaw drops deep in the inside channel and becomes the free man for Hibs. With Haring and Djoum busy covering Horgan, Mallan and Slivka, they are unable to also cover Shaw’s movement. With Dikamona deciding not to step up and stay close to Shaw, the Hibs striker can turn and dribble at Hearts’ back line. Shaw could also create a 2v1 here on the nearby Hearts wing-back. If Godinho decides to tuck in and close down the Hibs striker, the flank would be free for Sean Mackie to attack. If Godinho instead remains focused on his opposite man, Shaw could receive and drive into the space behind the Hearts wing-back. If the Hearts centre-back steps up in this scenario to remain close to Shaw, combining with Horgan would be a good option. Shaw could simply lay off to Horgan, who could drive into the space vacated by Dikamona. Alternately, Shaw could perform a one-two with Horgan and enter this space himself. If Hibs wanted to be more direct, Shaw’s movement could help. Should Dikamona step up, space is left behind him. Hanlon could then avoid playing into Shaw’s feet and send a longer ball in the channel for Horgan to race onto. In the process, Michael Smith could be drawn out and space could be created between Hearts’ remaining two centre-backs for Florian Kamberi to attack, opening up good cut-back/crossing opportunities.